Tomorow, Galerie 180 will open the new exhibition ‘Demophobia’ with works of the Ukrainian artist duo Synchrodogs and Dutch photographer Isolde Woudstra . Both the work of Synchrodogs as that of Isolde Woudstra is about the loner, the dreamer, about identity and body language. The relation between the person being portrayed and its surroundings play an important role in the images of these photographers. Synchrodogs focuses on the extravert, while Woudstra’s focus is more on the introvert side. Their pictures share a mysterious and sometimes ominous aesthetics, and invite the viewer through surrealistic suggestions to submerge oneself in a dream state. Synchrodogs originate from Ukraine, where in 2008 Tania Shcheglova (1989) and Roman Noven (1984) fell in love and started working together in the fields of art and fashion photography, blurring the boundaries between the two. 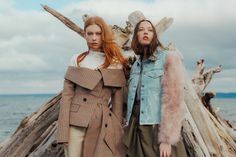 Their work includes collaborations with Neon magazine, Urban Outfitters, Vice and Harpers’ Bazaar Ukraine. In 2011 they won the Harpers’ Bazaar art photography award. With their quirky vision, the artist duo Synchrodogs realizes ideas and fantasies inspired by the ever-changing ambience of their environment. Tania Shcheglova and Roman Noven mainly use themselves as a showcase for their studies, deconstructing personality and producing images that dig deep into the core of human nature itself. Their main interest lies in bringing primitive instincts out of a viewer, allowing one to embrace their natural beauty, encouraging one to be free from any predispositions and fear of being misperceived. Spoon bending daily-life with her images, and with the constant appearance of her editorial work in several magazines, Isolde Woudstra shines through the latent relatable darkness of her autonomous vision. Her work is posited on the interface of reality and dream-world, while always maintaining its functionality and clarity. The images of her slightly sinister world are raw and natural but cause confusion at the same time. Woudstra graduated from the Utrecht Schoolof theArts in 2007, after which she started working for a variety of magazines while continuously pursuing her personal work. 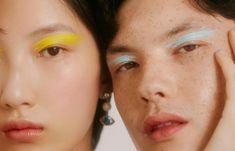 Her work was published in magazines as Dazed & Confused, Vice, Glamcult and the Word, and exhibited at Unseen Photo Fair, Foam and Nova Cultura Contemporanea. If you are in the area and would like to see the gallery.